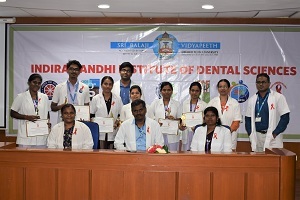 The Red Ribbon Club, Indira Gandhi Institute of Dental Sciences (IGIDS), Sri Balaji Vidyapeeth, conducted an Essay competition on HIV / AIDS awareness on the theme “Know your status” for the undergraduate and postgraduate students of IGIDS on 31st January 2019. Dr. John Baliah, Reader, Dept. of Oral Medicine and Radiology, IGIDS, judged the competition. The following were the winners of the essay competition. The valedictory program for prize distribution was held on 6th January 2019 between 2.30 pm to 3.30 pm at Ground floor lecture hall, MGMCRI. All the students of IGIDS attended the valedictory program. Prof Sathyanarayanan, Vice Principal (Admin) and Dr. Santha Devy, Vice Principal (Acad), IGIDS, awarded attractive prizes to the winners of the Essay competition. Information on Voluntary blood donation and the Voluntary blood donor’s directory were addressed to the gathering by Dr. Shivasakthy, Program organizer, Red Ribbon Club, IGIDS.